Dolphin Coast is an online video slot machine game released in October 2010 that is offered exclusively at online casinos powered by Microgaming. This online video slot game has 5 reels and you have 3125 bet ways to win per spin! The theme of Dolphin Coast is, as its name implies, all about friendly dolphins. Have you ever seen a real live dolphin? Or better yet, have you ever had the chance to touch one? People who have seen and touched a real dolphin say that it is one of the most exciting and happy moments in their lives. Dolphins are naturally friendly and playful creatures, and they love to play with humans, which is why Microgaming created the Dolphin Coast online slot game, to let online slot players experience the wonder, beauty and friendliness of these majestic water animals, without the hassle of getting out of the house! Bask in the multitude of bet ways in this game, which is a massive 3125 bet ways per spin! Also, it features a Stacked wild symbol, a Special wild symbol that enables you to play a Bonus Feature game with an 800,000 coin jackpot prize, a scatter symbol that enables you to play a Free Spin Bonus Feature game that offers an overflowing prize of 7,500,000 coins! So, what are you waiting for, you get win awesome prizes just by spending some time playing with the dolphins from the Dolphin Coast online slot game! Microgaming online slot games are offered to players in 2 formats – download and no-download. Whether you like to download their software first or you prefer to play instantly without the need to download, then Microgaming surely has online slot machine games to accommodate your each and every slot gaming needs. Dolphin Coast belongs to the download category of Microgaming slot games, which means you must download first before you are able to play this particular slot game. Dolphin Coast is a slot game specially created for those who loved spending some time walking along the coastline and watching dolphins in their natural habitat. 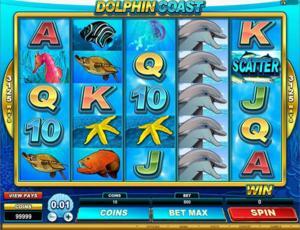 The Dolphin Coast online slot game features a massive 3125 permanently-enabled ways to win, scatter wins, Stacked wild symbols, a Special wild symbol that can activate the Special Dolphin Coast Bonus Feature game, a Free Spin Bonus Feature game, a maximum jackpot of 7,500,000 coins (in the Free Spin Bonus Feature game) and up to 800,000 coins (in the Special Dolphin Coast Bonus Feature game)! When it comes to providing high-quality graphics and great theme-related sounds, Microgaming does not lack any of these factors. They strive to provide players the most remarkable graphics and authentic sound effects which make any online slot game play truly fun and exciting. Most players state that they love online slot games that are run by Microgaming because they always have impressive animated symbols and attention-grabbing yet non-intrusive sounds. In Dolphin Coast, players are brought to the water world of dolphins, friendly water creatures whose only main food is fish and squid. They are always friendly towards humans and they love to show off their water skills whenever they can. The symbols are drawn realistically and in intricate detail. Beautiful and wondrous animated programming will be seen on the symbols when you manage to hit winning combinations with them, especially the wild symbols, scatter symbols and when you activate the Free Spin Bonus Feature game. The overall graphic design of Dolphin Coast shows the deep blue ocean floor, where dolphins and many other colorful water animals live and thrive in harmony. The main color used in this game is obviously blue, with other colors such as yellow, red, orange, green, brown, gray, black and white. The constant background music you will hear in this game is an upbeat but tranquil ocean-themed music with the main instruments being the guitar and piano. When you form winning combinations, shimmering and bubbly celebratory sounds are programmed to rejoice in your wins. Overall, the background music will definitely make you feel happy and relaxed while playing the Dolphin Coast online slot game. The card deck symbols available in the Dolphin Coast online video slot game are 10, J, Q, K, and Ace. The regular symbols that you will see in the Dolphin Coast online slot game are the Sea Turtle, Grouper, Jellyfish, Angelfish, Seahorse and the Starfish. The Wild Symbol is the Dolphin. It acts as a substitute for all other symbols (except for the scatter symbol and the special wild symbol) in order to help you complete a winning combination. The Dolphin wild symbols can only be found at the 2nd and 4th reels in the main Dolphin Coast online slot game, whereas it is found on all 5 reels in the Free Spin Bonus Feature game. The Dolphin Coast Logo (special) wild symbol can substitute for the Dolphin wild symbol to help you form winning combinations. In the main Dolphin Coast online slot game, it is possible for you to get many Dolphin wild symbols to come out on a reel at the same time, forming a Dolphin wild symbol Stack. The Stacked Dolphin wild symbols help you boost your chances of winning, by means of substituting for other symbols to complete winning combinations. There are no payouts given for the Dolphin wild symbols, and they do not appear Stacked during the Free Spin Bonus Feature games. There is a Special Wild Symbol in the Dolphin Coast online slot game, which is the Dolphin Coast Logo symbol. The Dolphin Coast Logo wild symbol functions as a substitute for other symbols to help you form winning combinations. The Dolphin Coast Logo wild symbol is only found on the 3rd reel. It can substitute for the Dolphin wild symbol too. If you managed to get the Dolphin Coast Logo wild symbol on the 3rd reel and it is involved in a winning combination, you will activate the Special Dolphin Coast Bonus Feature game. The Scatter Symbol is the School of Tuna symbol. Scatter symbols mean that they do not need to appear in a line (on an enabled pay line) for you to win. The School of Tuna scatter symbol can be scattered anywhere on the 5 reels for you to complete winning combinations, as long as there are 2 or more School of Tuna scatter symbols that appear. Your winnings are calculated by multiplying the School of Tuna scatter symbol combination payout (refer to the Payout table) by the total number of coins you’ve bet. If you get 3 or more School of Tuna scatter symbols (found anywhere on the 5 reels), you will trigger the Free Spin Bonus Feature game. Please take note that if you get a scatter win and a regular win, then you are paid out for both of these wins, because the School of Tuna scatter symbol is not required to come out on an enabled pay line for you to win. Scatter awards are independent from pay line awards, thus they are added to the pay line win. Please take note that if you get any winning combination, you can choose to gamble it in the Gamble Feature game, or you can just continue playing the regular Dolphin Coast online video slot machine game. Your wins will be multiplied a certain number of times if you correctly guess the card color, in which your wins are doubled. If you want to play the Gamble Feature game, simply click on the Gamble button. The second-screen Gamble Feature will be shown. You are to choose which Card Color will appear next: Black or Red. If you correctly guessed the correct Card Color, you have the option to gamble again or collect your winnings. If you choose to Gamble again, then you can select the Card Color of your choice. If you click the Collect button to collect your winnings, the Gamble Feature game will end, and you will be returned back to the regular Dolphin Coast online video slot game. Please take note that you can gamble your winnings until the gamble limit is obtained; during the Gamble Feature game, all winnings are collected automatically; and the gamble limit is set at 5 gambles per game, or up until the gamble amount limit of 10,000 coins is obtained. Dolphin Coast offers players 2 cool and fun Bonus Feature games for you! • Free Spin Bonus Feature Game – If you manage to get 3 or more School of Tuna scatter symbols that come out anywhere on the 5 reels, you will trigger the Free Spin Bonus Feature game. If you get 3, 4, or 5 School of Tuna scatter symbols (scattered anywhere on the 5 reels), you will trigger the Free Spin Bonus Feature game wherein you can get 15, 20, or 25 Free Spins respectively. All your winning combination payouts during these Free Spins are doubled! You can win up to a massive 7,500,000 coins in the Free Spin Bonus Feature game. Please note that the Dolphin wild symbols will not come out Stacked while in the Free Spin games. However, all the high-paying symbols will appear Stacked across all the reels. While playing the Free Spin Bonus Feature game, you can re-trigger the Free Spins by just getting 3 or more School of Tuna scatter symbols (anywhere on the reels), which will award you another set of 15, 20, or 25 Free Spins! The additional Free Spins are included to your remaining number of Free Spins. There is an infinite amount of Free Spins that one can win during the Free Spin Bonus Feature game. Please take note that since the School of Tuna symbol is a scatter symbol, your winnings are calculated via multiplying the School of Tuna scatter symbol combination payout (refer to the Payout table) by the total number of coins you’ve bet. Also, the Special Dolphin Coast Bonus Feature game cannot be triggered while the Free Spin Bonus Feature game is in play. If you managed to trigger the Free Spin Bonus Feature game and the Special Dolphin Coast Feature game simultaneously, the Special Dolphin Coast Bonus Feature game is played out first. Once the Free Spin Bonus Feature game is over, you will be then taken back to the main Dolphin Coast online slot game, and your winnings from the Free Spin games will be included to your overall balance. • Special Dolphin Coast Bonus Feature Game – Up to 800,000 coins can be won in the Special Dolphin Coast Bonus Feature game! When the Dolphin Coast Logo wild symbol comes out on the 3rd reel and is included in a winning combination, you will activate the Special Dolphin Coast Bonus Feature game. In this bonus game, you are to choose 1 of 3 dolphins on the screen, and they carry up to a 4x multiplier amount. Any wins completed by the Dolphin Coast Logo wild symbol are then multiplied by the multiplier amount you’ll get. Your winnings are collected automatically while in the Special Dolphin Coast Bonus Feature game. Please take note that the Special Dolphin Coast Bonus Feature game cannot be activated while you are playing the Free Spin Bonus Feature game. Once the Special Dolphin Coast Bonus Feature game is over, you will be then taken back to the main Dolphin Coast online slot game, and your winnings from the bonus game will be included to your overall balance. Dolphin Coast has 5 reels where you have a massive 3125 permanently-enabled bet ways to win per spin! The minimum bet is 0.01 and the maximum bet is 0.02. You can wager from 1 up to 10 coins. Thus, the maximum bet amount is 10.00 per spin. Please take note that the amounts mentioned above are in Pounds, but they will remain the same if you choose to play in US dollars, Euros, or Canadian dollars. Also, since this slot game has all pay ways permanently enabled for every spin, you cannot select or deselect pay ways. If you get multiple winning combinations, you are paid out for each of these combinations. The bet amount you play with is multiplied by a 50x bet multiplier per spin. For instance, if you bet 1 coin, then you are betting 1 coin x 50 bet multiplier which totals to 50 coins bet per spin. The maximum payout you can get in the main Dolphin Coast online slot game is 250 coins in each pay way. Players who regularly play online casino games apparently like to stay much longer on online slot games that have an Autoplay function. It’s absolutely fantastic that Dolphin Coast comes with a helpful Autoplay function! In Microgaming online slot games, they actually have 2 game modes – the Regular mode and the Expert mode. You can have the game spin automatically for you with the Autoplay function that can be found by clicking the Expert button (if you look closely at the brown line at the bottom part of the game screen, you will see the Expert button just below the Bet Max button). After customizing the Autoplay function to your preferences, just click on the Start button, and the game will automatically spin for you while you just sit back, relax, and enjoy playing this friendly dolphins-themed online video slot game!